Storytelling is the conveying of events in words often by improvisation or . Stories or narratives have been a means of entertainment, education, preservation of culture and in order to instill moral values. Crucial elements of stories and storytelling include plot and characters, as well as the narrative point of view. The occupants of the carriage were two small girls and a small boy. An aunt belonging to the children occupied one corner seat, and the further corner seat on the opposite side was occupied by a bachelor who was a stranger to their party, however, the noisily restless children were to his corner and most of the aunt's remarks seemed to begin with "Don't," and nearly all of the children's remarks began with "Why?" "Come over here and listen to a story," said the aunt, when the bachelor had looked twice at her and once at the communication . The children moved towards the aunt's end of the carriage. her reputation as a story-teller did not rank high in their . In a low, confidential voice, interrupted at frequent intervals by loud, questionings from her listeners, she began a uninteresting story about a little girl who was so good that was finally saved from a mad bull by a number of who admired her moral character. "It's the stupidest story we've ever heard," said the children, with conviction. "Perhaps you would like to tell them a story," was the aunt's in instant defence at this unexpected attack. The children's momentarily-aroused interest began at once to ; all stories seemed dreadfully alike, no who told them. "She did all that she was told, she was always truthful, she kept her clothes clean, learned her lessons perfectly, and was polite in her manners - in a word - she was horribly good." There was a wave of reaction in of the story; the word horrible in connection with goodness seemed to introduce a ring of truth that was absent from the aunt's tales. "She was so good," continued the bachelor, "that she won several medals for goodness, which she always wore, pinned on to her dress. There was a medal for , another medal for punctuality, and a third for good behaviour. They were large metal medals and they clicked against one another as she walked. No other child in the town had as many as three medals and the Prince of the country got to hear about it, and he said that as she was so very good she might be allowed to walk in his park, which was so beautiful that no children were ever allowed in it. However, Bertha was rather sorry to find that there were no flowers in the park. She had promised her aunts, with tears in her eyes, that she would not any of the kind Prince's flowers, so of course it made her feel silly to find that there were no flowers to pick." "Why weren't there any flowers?" demanded Cyril, the boy. The aunt permitted herself a smile, which might almost have been described as a . "Because there were lots of little pigs running all over the place and the pigs had eaten them all," said the bachelor promptly. "The gardeners had told the Prince that you couldn't have pigs and flowers, so he decided to have pigs and no flowers." There was a of approval at the excellence of the Prince's decision; so many people would have decided the other way round. The aunt suppressed a of admiration. "There were lots of other things in the park. There were ponds with fish in them, and trees with beautiful parrots that said clever things at a moment's , and humming birds that all the popular of the day. Bertha walked up and down and enjoyed herself immensely, and thought to herself: 'If I were not so extraordinarily good I should not have been allowed to come here to enjoy all that there is to be seen,' and her three medals against one another as she walked and helped to remind her how very good she really was. Just then an enormous wolf came into the park to see if it could catch a fat little pig for its supper. The first thing that it saw was Bertha; her was so spotlessly white and clean that it could be seen from a great distance. Bertha saw the wolf and ran as hard as she could, and the wolf came after her with huge leaps and . She managed to reach a of myrtle bushes and she hid herself in one of the thickest of the bushes. The wolf came among the branches. Bertha was terribly frightened, and thought to herself: 'If I had not been so extraordinarily good I should have been safe in the town at this moment.' However, the of the myrtle was so strong that the wolf could not sniff out where Bertha was hiding, and the bushes were so thick that he could not catch sight of her, so he thought he go off and catch a little pig instead. Bertha was trembling very much at having the wolf prowling and sniffing so near her, and as she trembled the medal for obedience clinked against the medals for good and punctuality. The wolf was just moving away when he heard the sound of the medals clinking in a bush quite near him. He into the bush and dragged Bertha out and her to the last . All that was left of her were her shoes, bits of clothing, and the three medals for goodness." The children all agreed that it was the ONLY beautiful story they had ever heard. A opinion came from the aunt. "A most story to tell to young children! You have the effect of years of careful teaching." 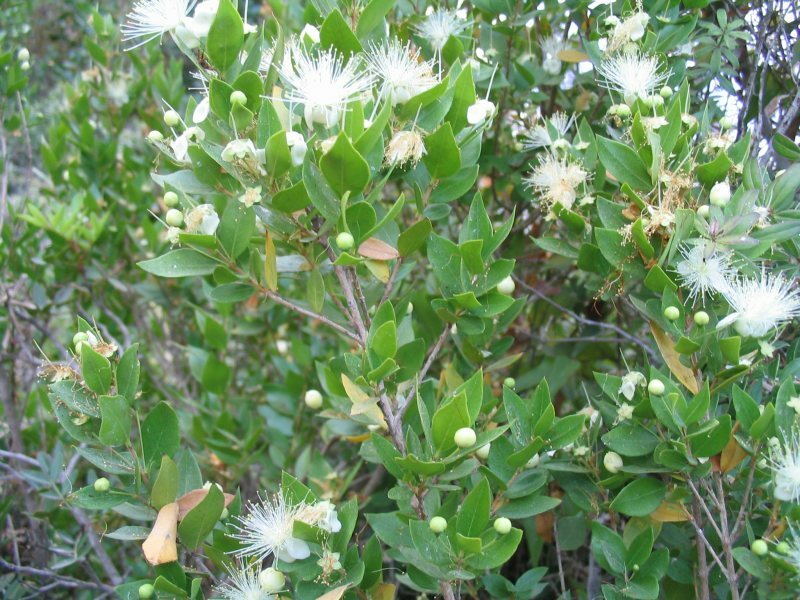 The Myrtle (Myrtus) is a genus of one or two species of flowering plants in the family Myrtaceae, native to southern Europe and north Africa. They are evergreen shrubs or small trees, growing to 5 m tall. The leaves are entire, 3-5 cm long, with a fragrant essential oil. The star-like flowers have five petals and sepals, and numerous stamens. Petals are usually white. The fruits are globose blue-black berries containing several seeds. The flowers are pollinated by insects, and the seeds dispersed by birds that feed on the berries.